Ships within 14 business days. Please allow up to 3 additional weeks transit time for your item to arrive. Transform your bedroom with this contemporary queen sized bed. The traditional poster style is pared down and simplified in this modern rendition. The silhouette is clean and simple, detailed with a two-toned white and grey oak finish. A low profile, padded headboard adds comfort without detracting from the streamlined style. 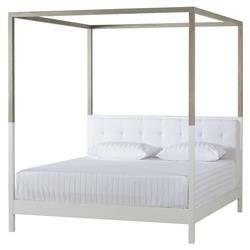 For coastal, modern or minimal interiors, the Roosevelt Bed is a dream come true.